Who is the Dating Goddess®? The Dr. Jenn interview discussing dating after 40 and the Adventures in Delicious Dating After 40 book series is now available for downloading. Get your copy of the 13 books in the Adventures in Delicious Dating After 40™ series. Date or Wait: Are You Ready for Mr. Great? "The Dating Goddess has put her true voice into this book: smart, funny, truthful. Did I say funny? Yes. In a book on the mysteries of mid-life connections, you couldn't ask for more. A tart and smart companion who tells the ticks, tricks and treasures of dating." "The Dating Goddess has provided a rare gem in Date or Wait. She offers fresh ideas on a topic that has been around as long as people have been seeking love. She blends her practical ideas, thoughtful insights and playful humor to make Date or Wait a fun, thought provoking read. 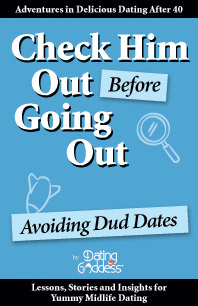 Don't delay having your first 'date' with the Dating Goddess. I promise that you'll want more and more of this gifted writer's work." --Susan Page, bestselling author, If I'm So Wonderful Why Am I Still Single? 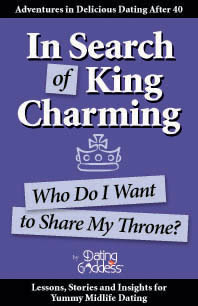 In Search of King Charming: Who Do I Want to Share My Throne? "ISO King Charming is a uniquely intelligent, witty, useful, and candid discussion of how real single women in the actual world handle authentic relationships. The Dating Goddess speaks with humor and authority, as one mature woman to another, and offers advice as well as perspective in every breezy, lively paragraph." 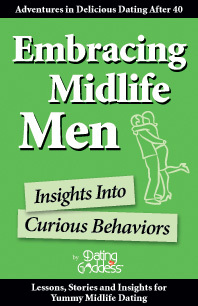 Embracing Midlife Men: Insights Into Curious Behaviors. 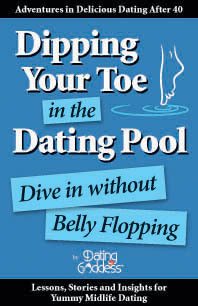 Dipping Your Toe in the Dating Pool: Dive In Without Belly Flopping. 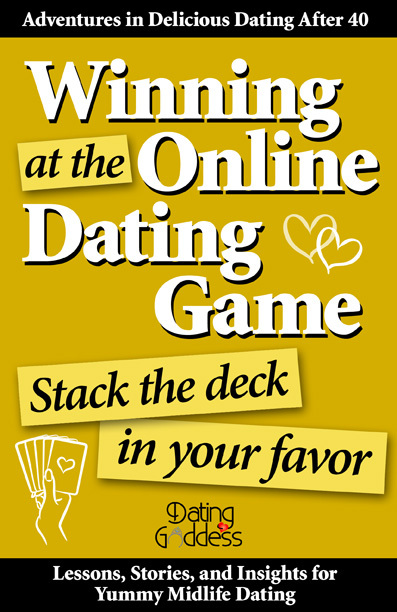 Winning at the Online Dating Game: Stack the Deck in Your Favor. First-Rate First Dates: Increasing the Chances of a Second Date. 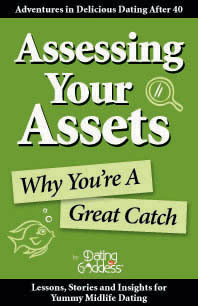 Download your eBook $10 . 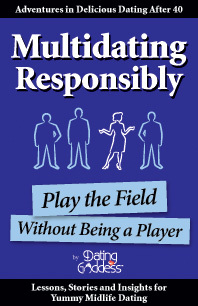 Multidating Responsibly: Play the Field Without Being A Player. Download your PDF eBook $10. 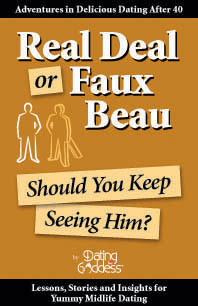 Real Deal or Faux Beau: Should You Keep Seeing Him? 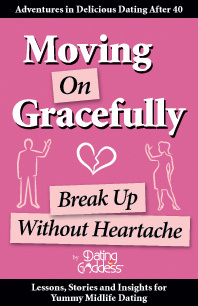 Moving On Gracefully: Break Up Without Heartache. From Fear to Frolic: Get Naked Without Getting Embarrassed. 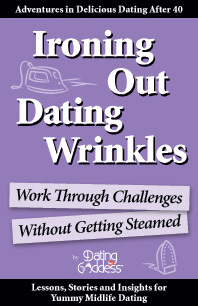 Ironing Out Dating Wrinkles: Work Through Challenges Without Getting Steamed. 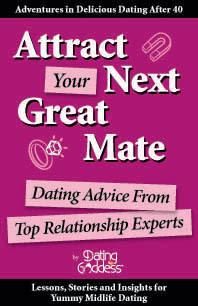 Get DG’s 152-page eBook Attract Your Next Great Mate: Dating Advice From Top Relationship Experts and the eBooklet, Tips, Tools, and Resources for the Second Half of Life with any Adventures in Delicious Dating After 40 book order. You've Got to Kiss a Lot of ... Princes! Sign up now to receive the free eBook and DG's postings directly to your In Box -- it's free! If you like DG’s postings, please donate! Catherinette on How much mind space does he take? Trevor on Are you trying to date men who think they are hotter than they are? This site was named in the top 10 dating blogs on the Web! Here's a list of some of the sites DG has tried. 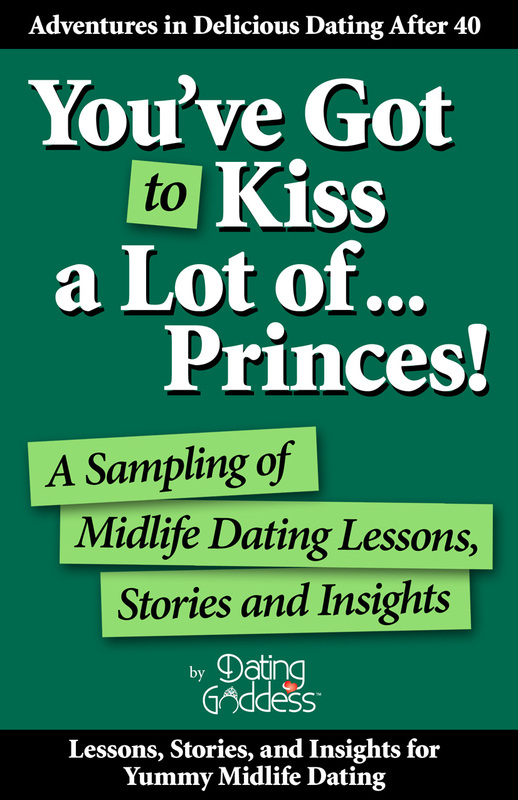 "The Dating Goddess pens this delightful blog about lessons and insights for 'yummy midlife dating.' 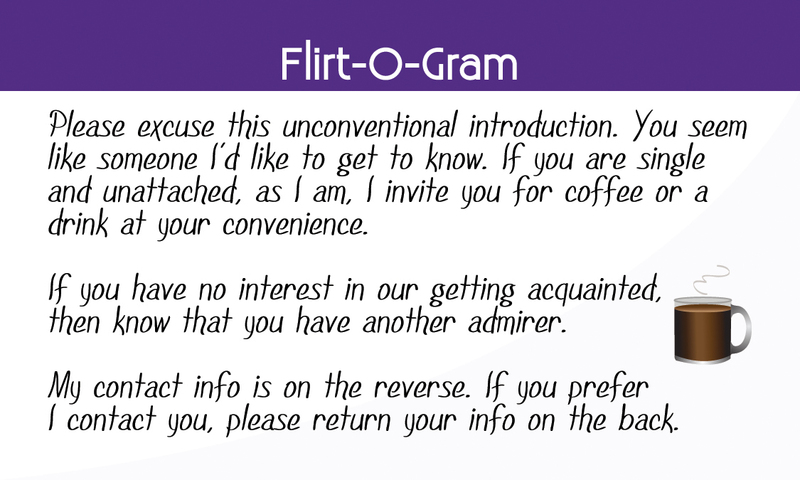 Hilarious and spunky, her blog is a joy to read and provides great advice for those attempting to find midlife love." Dating Goddess® is a registered trademark.